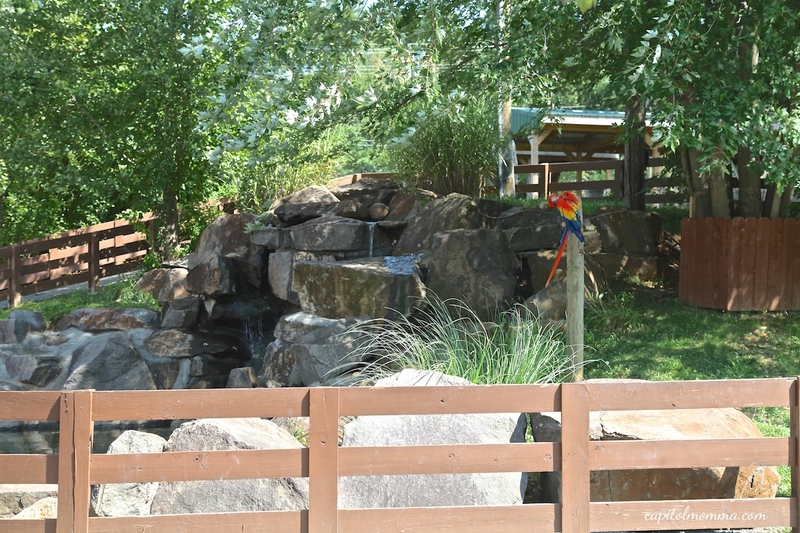 The Reston Zoo is a 30 acre zoo located in Fairfax county. 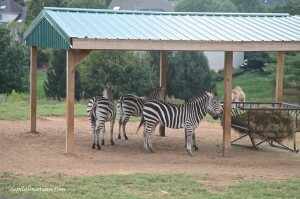 It is a small, interactive zoo that is home to hundreds of animals, many of which you can get up close to pet and feed. 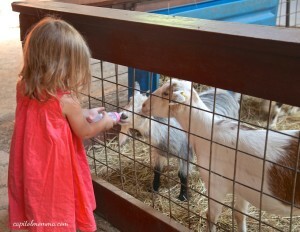 The little ones especially love the interaction with the animals and it’s not something that many other zoos offer. 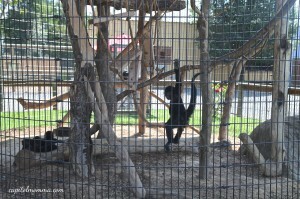 It is a nice change from the National Zoo as it is easy to navigate and you can see everything here in a couple hours. 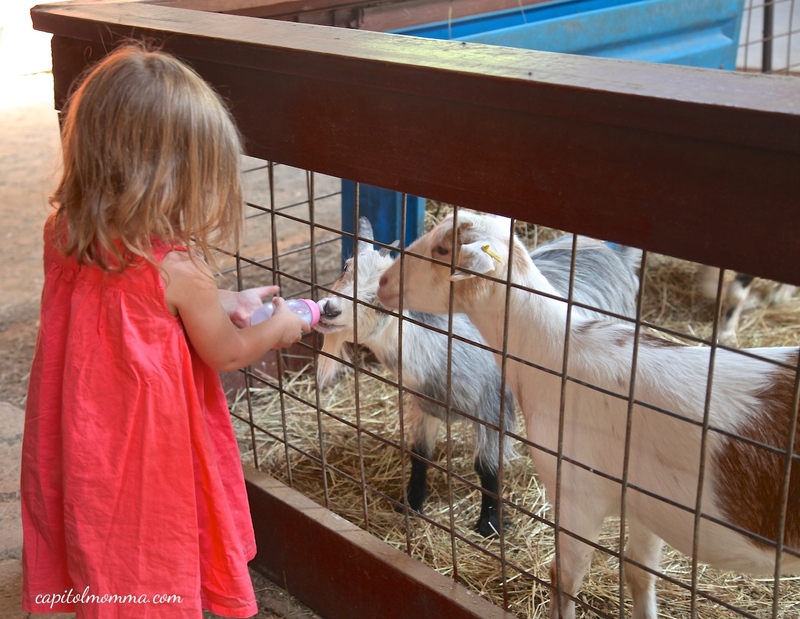 The zoo includes a petting barn, budgie aviary, reptile house, kangaroo walk through and a safari wagon ride which is the highlight of the zoo for my girls. At the gift shop I purchased animal feed, a lamb bottle, and budgie feeding sticks. 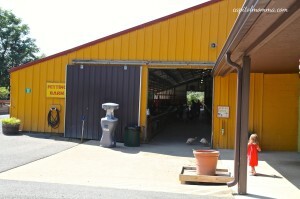 We first went to the petting barn to feed the goats, lambs, and ducks. 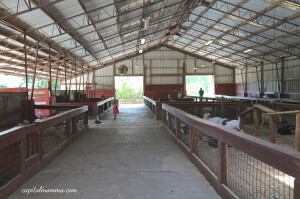 Also, in the petting barn are pigs, chickens, llamas, and rabbits. Across from the petting barn are tortoises, brown-headed spider monkeys, indian peafowls, a scarlet macaw, and more pigs. 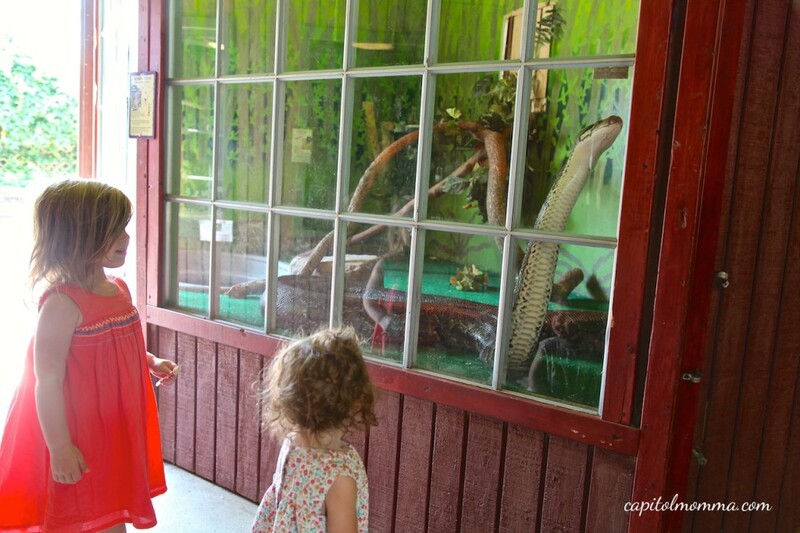 Next we went into the reptile house (my least favorite part) to look at the snakes, frogs, turtles, baby alligators, and spiders. This was a quick 2 minute stroll through as I am pretty terrified of snakes! Eeeeeeeek! As we continued through the zoo, we visited the Andean condors, mountain cotimundis, ring-tailed lemurs, and golden-headed lion tamarins. 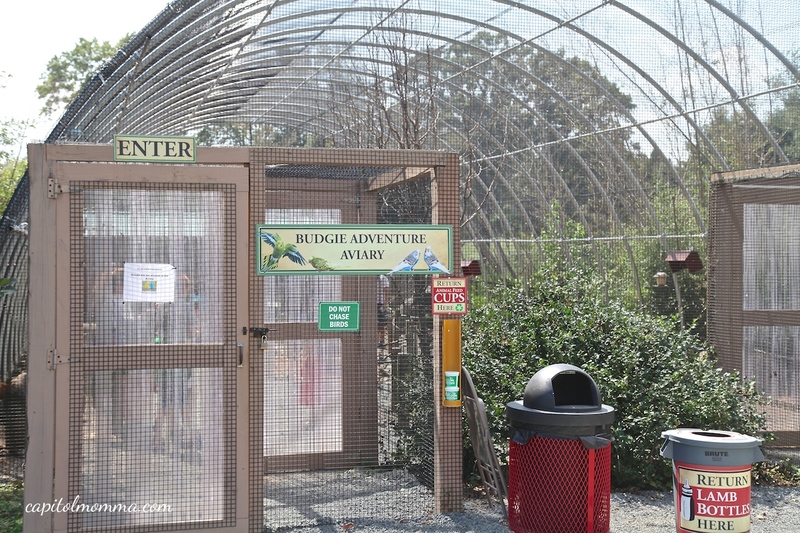 Then we went into the free flight budgie aviary to feed the birds. 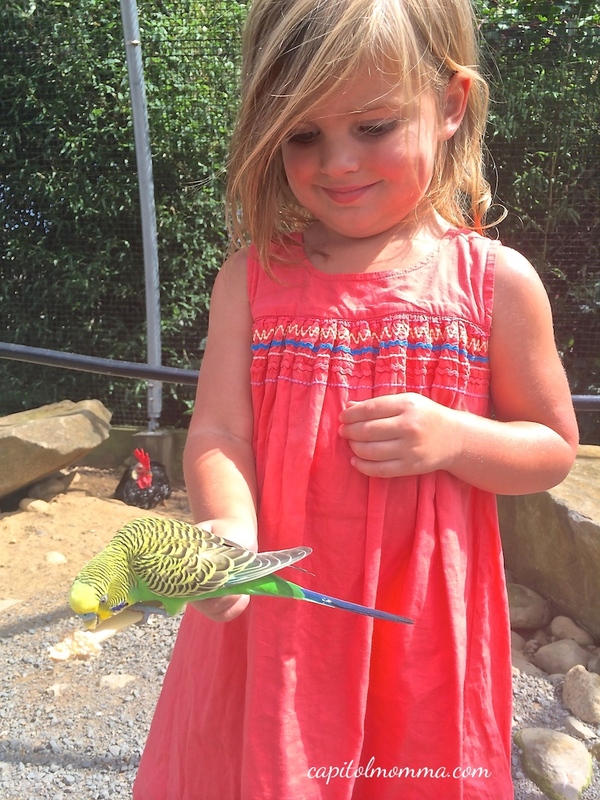 Clara was timid at first but then grew more confident in holding the feeding stick while the birds landed to eat. 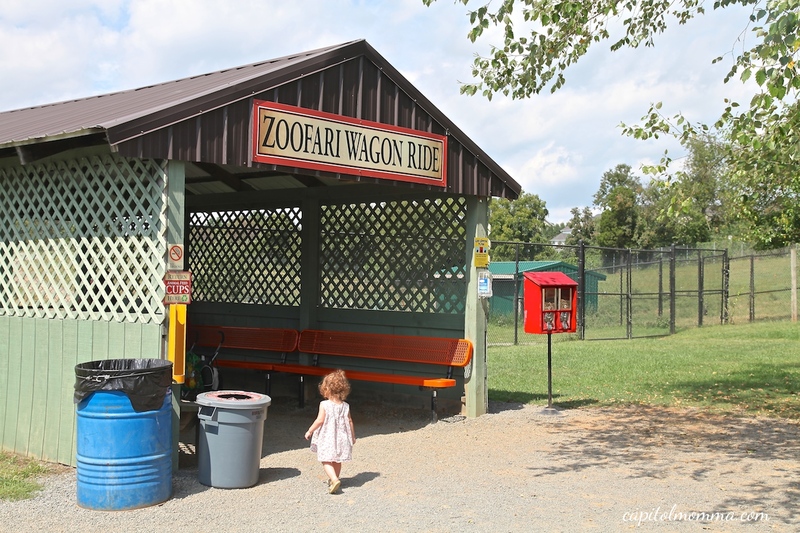 Next we went on the Zoofari Wagon ride. 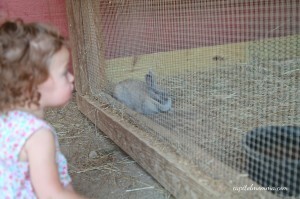 This is definitely my girls favorite part of the zoo. 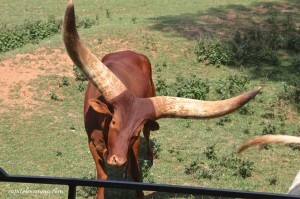 It is a 20 minute ride through the lower half of the zoo that is the free roaming preserve. 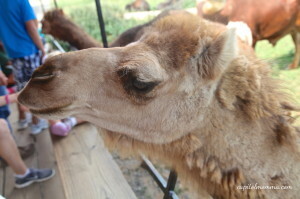 On this ride we saw camels, antelopes, zebras, buffalo, ostrich, watusi, and llamas. 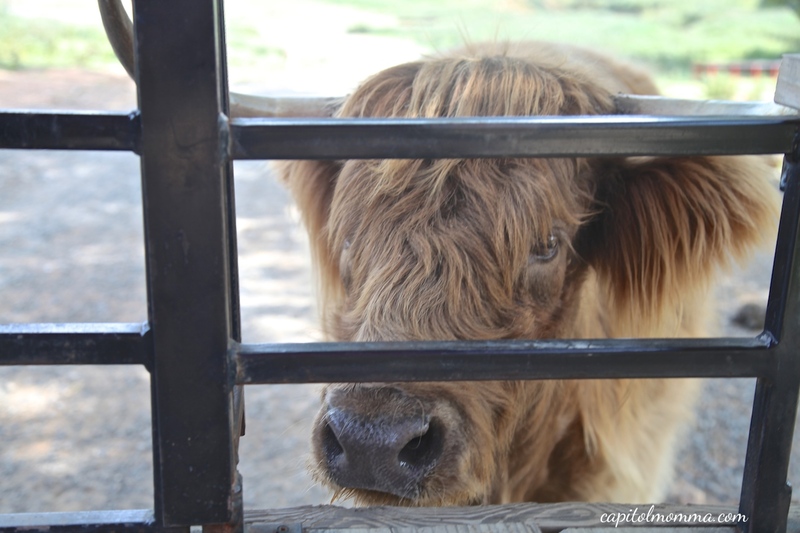 The animals are all very friendly and will come right up to the wagon when it stops. Be sure to save some animal feed for the ride. The wagon stops a couple times and the guide shares interesting facts about the animals. 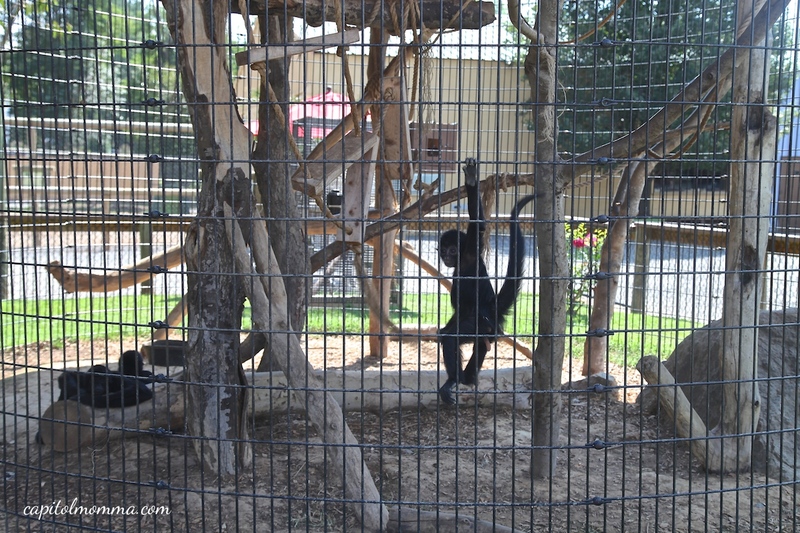 After the wagon ride, we still had a few more areas of the zoo to explore. 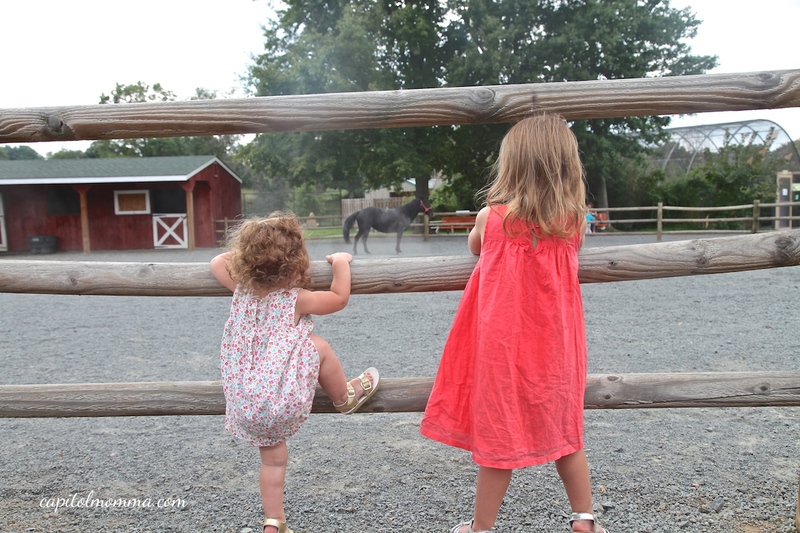 The girls enjoyed watching and petting the ponies. 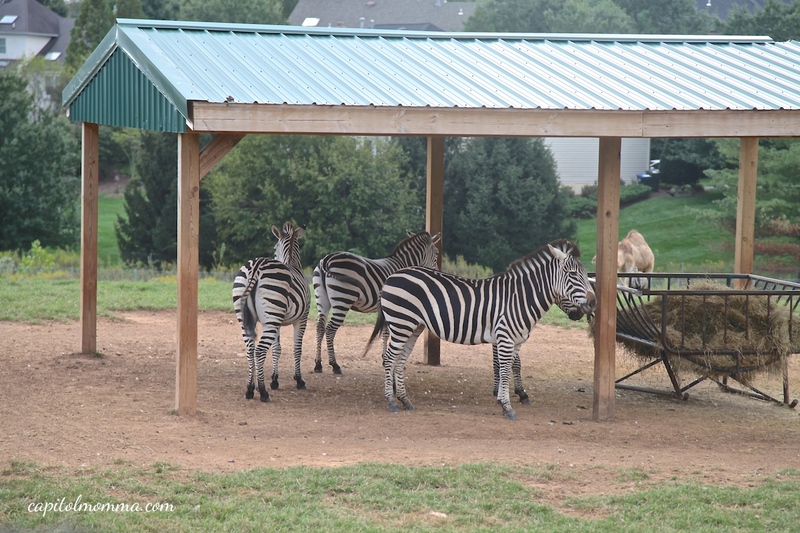 The zoo offers pony rides for $4. 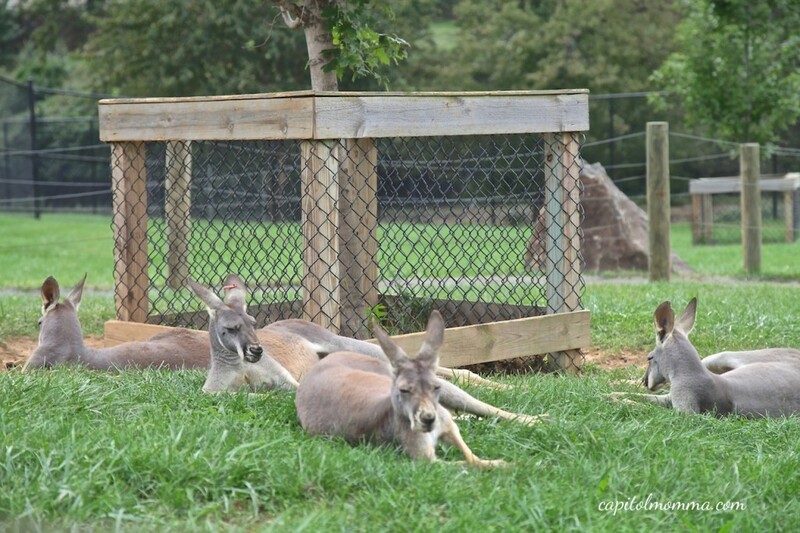 Next we went through the kangaroo walk. We finished with a quick stop at the alligators and then walked back to the gift shop. I bought the girls an ice cream treat and it was time to head home. 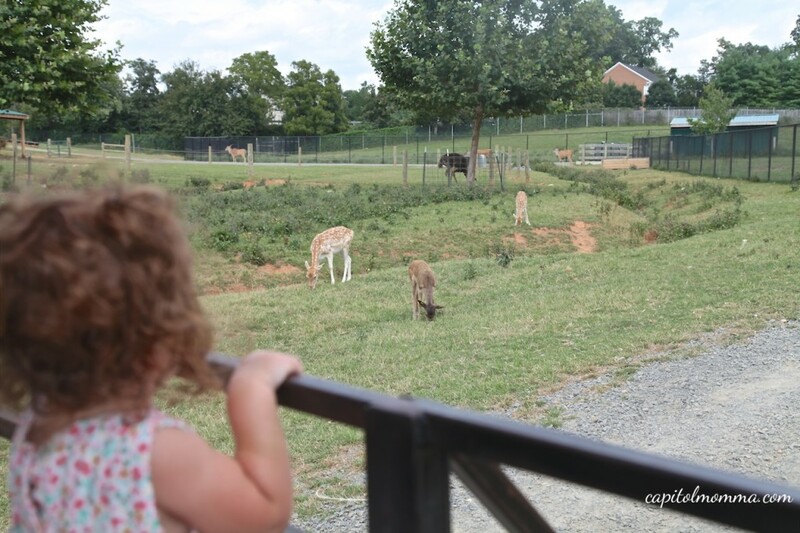 We definitely recommend a trip to the Reston zoo! •Ticket prices: Adult (13-64) $12.95, Senior (65+) $11.95, Child (2-12) $9.95, Child under 2 is free. •The Zoofari Wagon Ride is included in the admission price. The wagon leaves at the top of every hour beginning at 10am. Be sure to save some animal feed for the wagon ride! •Budgie bird feed sticks are $1 each, animal feed is $3.25/cup, lamb bottles are $1.50/bottle. •The zoo is stroller friendly. But strollers are not allowed on the wagon ride. They must be parked in the designated area before loading the wagon. •Outside food and beverages are allowed and there are several picnic areas available. 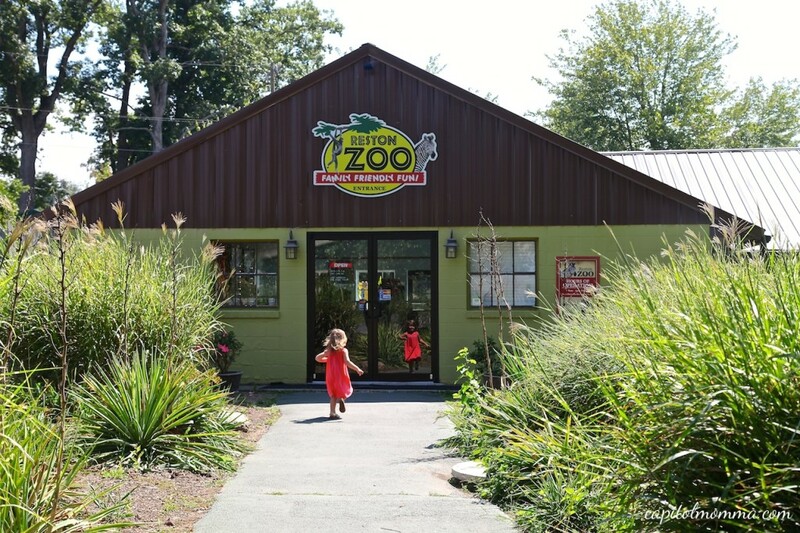 •The zoo now has a Zoo Tots program which includes story time with a zoo keeper followed by animal interaction. 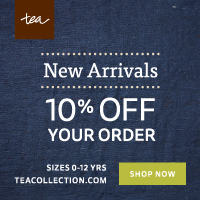 10:30am & 1:30pm on select Tuesdays and Thursdays throughout September and October. $4.00 or $3.00 for season pass holders. 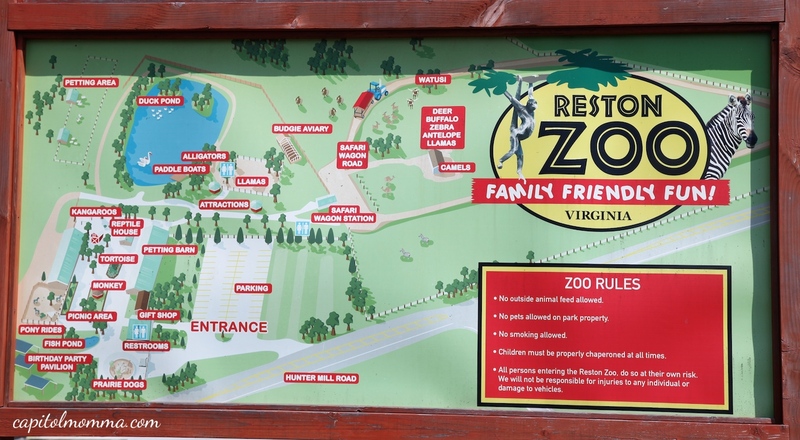 •The Reston Zoo sponsors an Easter Egg hunt in the spring, Boo at the Zoo in October, and Zoolights in December to celebrate the holidays.